At the outset, we want to acknowledge that our team is behind in releasing digests. CourtWatch MA is an all-volunteer effort and we are working diligently to make all of our data analysis public as soon as possible. We thank our readers for your patience. And we thank our volunteers for their consistent timeliness and dedication to this collective endeavor. From February 13th to February 19th, courtwatchers observed 162 cases at arraignment across four divisions of Boston Municipal Court (BMC Central, Roxbury, Dorchester, and East Boston). This was our first week with observation in East Boston, though we only had one courtwatcher there on one day. We also note that this week included only four days of observations because of a court holiday. 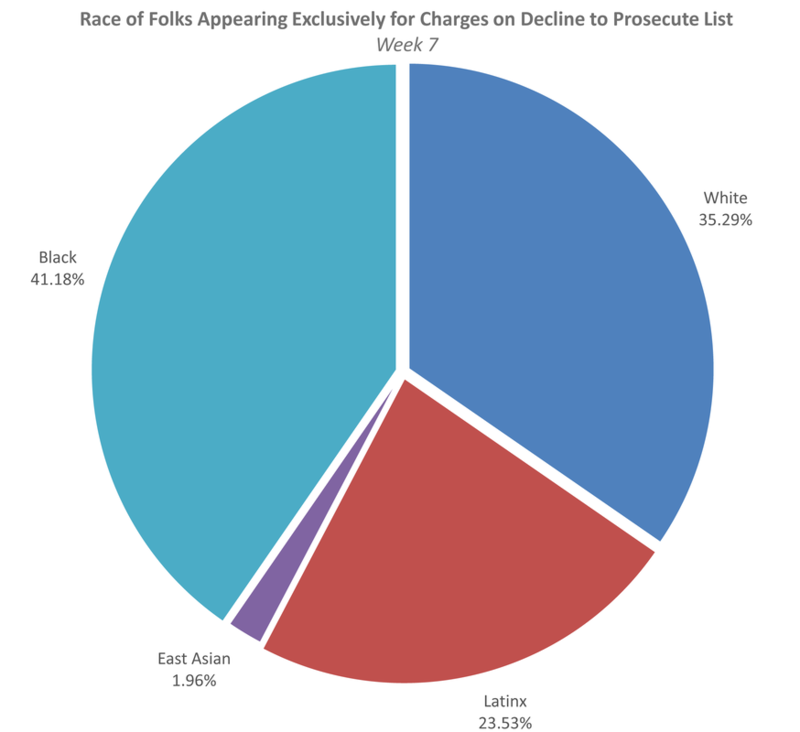 This week, 45.7% of the cases we observed involved only charges that Suffolk County District Attorney Rachael Rollins has pledged to decline to prosecute, either by dismissing at arraignment or diverting through a non-criminal proceeding, program, or outcome. As we’ve seen every week since we began observing, this means almost half the cases we observed this week involved only crimes that District Attorney Rollins identified as low-level, non-violent crimes of poverty, mental illness, and addiction. ​Reminder: under the umbrella of cases that DA Rollins pledged to decline to prosecute, we categorize cases that are dismissed outright as dismissals. Cases that are conditionally dismissed – with court costs, community service hours, or a treatment program – and therefore require a subsequent appearance in court are diverted cases. We remain concerned about the impact of imposing conditions which require time, money, or transportation on poor and working class people facing charges. 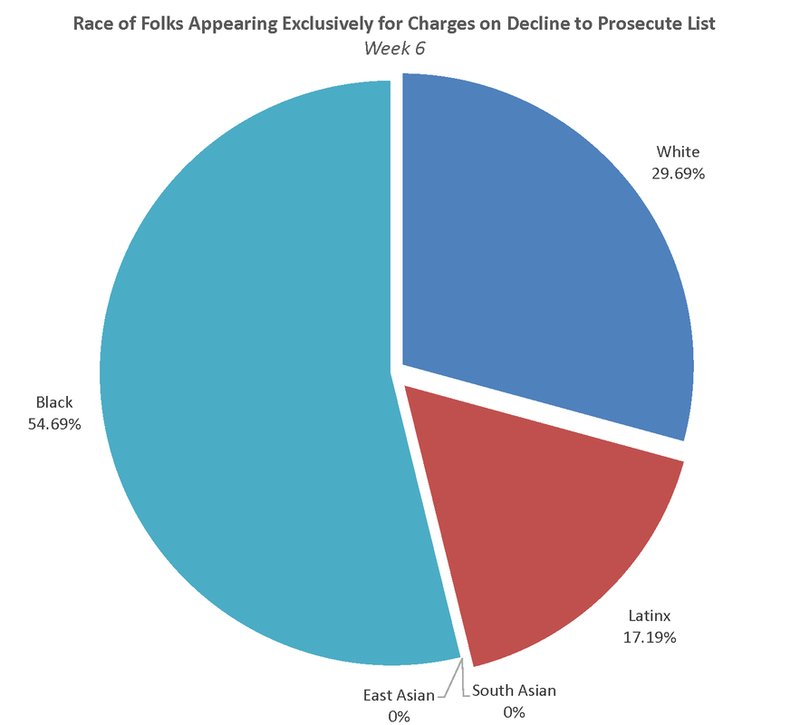 There were 74 cases involving ONLY charges on the decline to prosecute list this week. 52.7% of these cases (39 cases) advanced as criminal matters. 22 of these cases were dismissed at arraignment. Therefore, a total of 35 cases, or roughly 47.3%, were declined within the meaning of DA Rollins’ campaign pledge. Our dataset this week is smaller than some prior weeks; we do not want to overstate the fact that fewer cases were declined this week by percentage, given how small and variable the datasets are week to week. What we can say, once again, is we still are not seeing significant improvement or substantially more cases being declined. Our First 100 Days project aims to hold DA Rollins accountable precisely because we are excited at the prospect of transformation for our courts and our communities. DA Rollins rightly acknowledges that our criminal punishment system causes harm by criminalizing poverty, addiction, and mental illness; that cash bail is arbitrarily set and keeps people in jail because they cannot afford bail; that court system fines and fees criminalize poverty; and that the lack of transparency in prosecutors’ offices prevents accountability and protects them from being held responsible for the decisions they make about residents. She identified those harms more than a year ago when she announced her candidacy. Her vision for justice energized the electorate. She won a hotly contested primary with a significant margin of victory, and she holds a mandate for change with more than 82% of the general election vote. After months of developing policy on the campaign trail, planning for her transition, and almost three months into her administration, substantive policies have not been issued or implemented. Both in the press and in meetings with community members, DA Rollins’ office continues to promise that much-anticipated changes are coming. Compared to the rollout of policy by her peers—whether Larry Krasner in Philadelphia, Wesley Bell in St. Louis County, or Andrea Harrington in Berkshire County, MA—DA Rollins has fallen behind. Our push for accountability is not motivated by general good government principles; this isn’t simply about an elected official doing what they said. Each week, we see a snapshot of dozens of individual people who are harmed by overly punitive responses to arrests DA Rollins recognizes are rooted in racism, poverty, addiction, and mental illness. We see ADAs recommend holding people in jail on unaffordable cash bail – both for charges she pledged to decline entirely and for more serious charges. In those serious cases, ADAs are not asking for evidentiary dangerousness hearings to prove someone is a threat to a specific person or the community. Instead they are requesting bail in the tens of thousands to ensure someone will be incarcerated before their trial while they are legally presumed innocent. We are more than 75% through the First 100 Days. The Suffolk County District Attorney’s Office still lacks policy on the core components of DA Rollins’ platform, even though DA Rollins has spoken publicly about the fact that as a District Attorney she is not hampered by any legislative body and can act swiftly as an executive to implement policy. In one week, DA Rollins will have her first public Town Hall. During that public convening, DA Rollins will be taking questions in person and online with #AskDARollins. We hope the Suffolk County District Attorney’s Office will take some time to address how they are going to rectify the harm caused by the delay in issuing more humane policies. Driving cases did not comprise a majority of dismissals this week or as substantial a plurality of overall cases, as they have every other week we have observed. Of the 22 cases that were dismissed this week, 8 were driving cases (36.4%). The other 14 cases dismissed at arraignment were incidents of trespass (6), shoplifting (1), minor in possession of alcohol (3), drug possession (2), and drug possession with intent to distribute (2). In at least 9 of these cases, the person being arraigned was not present in court and both the ADA and judge sought to dismiss anyway. This is a positive trend and we applaud judges and ADAs for recognizing that these cases can and should be dismissed, regardless of whether someone appears in court. We note that this was the first week in which we saw cases in which someone was charged only with being a minor in possession of alcohol. In 1 of these dismissed cases, a man charged with drug possession with intent to distribute went from being in jail to having his case entirely dismissed. In a separate case involving class B possession with intent to distribute, the ADA verified proof of participation in a drug treatment program before moving to dismiss. The man being arraigned was already enrolled in a treatment program called Out of the Shadows, where he participates in AA and NA meetings as well as voluntary breathalyzer and drug screenings. In another case this week, a charge of class B drug possession was dismissed outright only after a clean urine test. We have coded these cases as outright dismissals because the individuals were not required to report back to court on a future date and the charges were dismissed. However, these were not truly condition-free dismissals. People may fail drug tests for the use of legal drugs, for example marijuana or prescribed medications. Further, drug-free court orders unfairly punish people for a normal condition of substance use disorder, bound to appear on the path to recovery: relapse. More than 60 legislators in Massachusetts are working to alter this practice in the context of probation, co-sponsoring legislation to prevent drug testing of people in recovery while they’re on probation. We urge DA Rollins to abandon this practice pretrial and instead seek to dismiss such cases outright so that people struggling with substance use may seek treatment without threat of criminal penalty. Dismissing only on the basis of clean drug tests simply criminalizes addiction. A significant majority of driving cases (84.2%) were declined this week at arraignment. Undocumented people are particularly vulnerable when arrested and arraigned on driving charges. It is our hope that declining to prosecute all driving charges will disincentive arrest so driving matters can be handled civilly like they are in many predominantly white suburbs. In one driving case this week, a man was charged with unlicensed operation of a motor vehicle. The ADA moved to dismiss with court costs or community service. Judge Sally Kelly denied that ADA request on the grounds that if the DA wants to decline to prosecute they must file a nolle prosequi. The ADA said they had to get DA approval to proceed. Accordingly, the man was released on personal recognizance with a return date for six weeks later. As of today’s date, the case remains an open criminal matter on the trial court electronic case access platform. We highlight this example for two reasons. First, we know that DA Rollins will likely face resistance from other system actors (judges, probation, police) in enacting her vision; the process of changing the culture of the courts will take persistence, and the sooner her office starts working to reshape customs and practices, the sooner she’ll start reducing harm in individual cases. Second, the absence of a policy memo outlining how an ADA should respond when met with resistance in a case like this meant this man’s case continued as a criminal prosecution; we believe that the existence of a memo and training on office policy could have prevented a situation like this from transpiring. Judges have their own practices, and DA Rollins can prepare ADAs to navigate judges’ preferences. DA Rollins needs a robust policy implementation plan to aid ADAs in making strong recommendations both to decline cases and for release on recognizance in cases where they might formerly have requested cash bail. For all the charge categories DA Rollins pledged to decline, ADAs should come to arraignment hearings prepared with nolle prosequi statements. This is the only way DA Rollins can ensure consistency in policy across courtrooms; otherwise specific judges may decline ADA motions to dismiss—something we’ve witnessed Judge Kelly do before in separate instances. We categorize any dismissal that included conditions requiring a future court appearance as a diverted case. This week 13 cases were diverted. Every disposition involved at least one condition, like treatment; a court fee; community service; or probation, despite no findings of fact or guilt. ADAs usually refer to these cases as “conditional dismissals,” but individuals were generally required to report back to court at least once on a future date to prove compliance with the condition. Additional appearances cause stress and strain on individuals and families that could be avoided by outright dismissals. A majority of the diversions were driving cases – 8 of the 13 (61.5%) cases diverted this week. For driving cases, judges usually gave the person an option of returning with proof of license/registration/insurance, paying a fee between $50 and $200, completing 20 hours community service, or enrolling in driving school. We also note that prosecutors continue to rely on punitive conditions that penalize people for being poor, despite DA Rollins’ emphasis during her campaign and recent interviews that she opposes the use of fines and fees to punish people. Finally, completing community service within the requisite timeframe may mean people need to call out of or cancel work, miss classes, or arrange childcare. Though many judges allow individuals to do community service at a place of their choice, some mandate that individuals serve through the state-run program that requires manual labor and is only offered on certain days. This kind of community service has no restorative value and is imposed before a person has been convicted of any wrongdoing. Pre-arraignment community service is simply a punishment for being arrested. In 17 cases that advanced as criminal matters, the person being arraigned was released on personal recognizance. In many such cases, the court also imposed conditions—especially common was a stay away or no contact order for the place of the incident or a person involved. Sometimes a person is required to stay away from a shelter where they lived for the last year or a major transit hub through which they have to commute. In one case of drug possession with intent to distribute, a 25-year-old had been released on an unknown bail amount at the police station. The judge adjusted his release conditions to personal recognizance. The only substance involved: marijuana. Police allegedly found 20-25 bags of marijuana and a scale in his car. DA Rollins speaks about the racial injustice in historical marijuana enforcement, yet her office continues to pursue marijuana cases, including this case of possession with intent to distribute marijuana—a charge she pledged to decline and a legal substance in the state of Massachusetts. Based on DA Rollins’ campaign pledges, this case should not be prosecuted. In 7 cases exclusively involving charges DA Rollins pledged to decline this week, bail was set. Bail amounts ranged from $100 to $500. Four of these cases involved charges of drug possession and/or possession with intent to distribute and/or resisting arrest. In one of these cases, bail was set on the new charges and bail was revoked on a prior case. The other three cases were charges of larceny under $1200. In one of these misdemeanor larceny cases, the man being arraigned was homeless and receiving methadone and psychiatric treatment. He already has an outstanding court order for money owed. The ADA recommended $500 bail. The judge imposed $200 bail. A homeless man charged with a crime DA Rollins pledged to decline on a stable treatment regimen was denied access to care and kept in jail because of the actions of a prosecutor who reports to DA Rollins in the Suffolk County District Attorney’s Office. In the remaining 15 cases, we don’t know the final release decision or case outcome because the arraignment was continued—i.e. postponed to a future date or time (7 cases), the person being arraigned remained detained (despite the judge deciding to release them on personal recognizance on the pending charges) in order to resolve a warrant in another court (2 cases), the person did not appear for arraignment and a warrant was issued (5 cases), or the courtwatcher wasn’t sure what happened (1 case). We again note that people not showing up for arraignment happens rarely, and that courts don’t have to verify that a person actually received a summons before issuing an arrest warrant—a disturbing practice we hope DA Rollins will push to change. Our data collection on bail may undercount people who have already paid bail at the police station. Courtwatchers have not always been able to reliably document when someone has already posted bail, and in what amount, if they freely walk into court. This is not always explicitly addressed on the record. Bail is set at the police station by court clerks. How bail amounts are decided is not transparent to the public and bail is set with very little oversight. The remaining 8 people were assessed bail (5), had their bail revoked and were assessed bail (1), or were held for transport to another court for an open warrant (2). In other words, 9 people spent time in jail and ultimately were not prosecuted or were released; they were detained without an ability to shower, change clothes, see their kids, walk their pets, take their medications, or communicate with their jobs or families—only to have a judge determine there was no good reason to detain them. Further, this means in 52.9% of cases in which a bail magistrate declined to release someone this week, the judge released the individual or diverted or dismissed that person’s case. While clerks make decisions to set bail at police stations independently of the DA’s office, we hope that District Attorney Rollins will both express her contempt for pre-trial detention and implement a strong policy that avoids pre-trial detention at all costs. ​This week courtwatchers observed many cases where the person being arraigned did not appear, and therefore racial demographic observations were impossible. 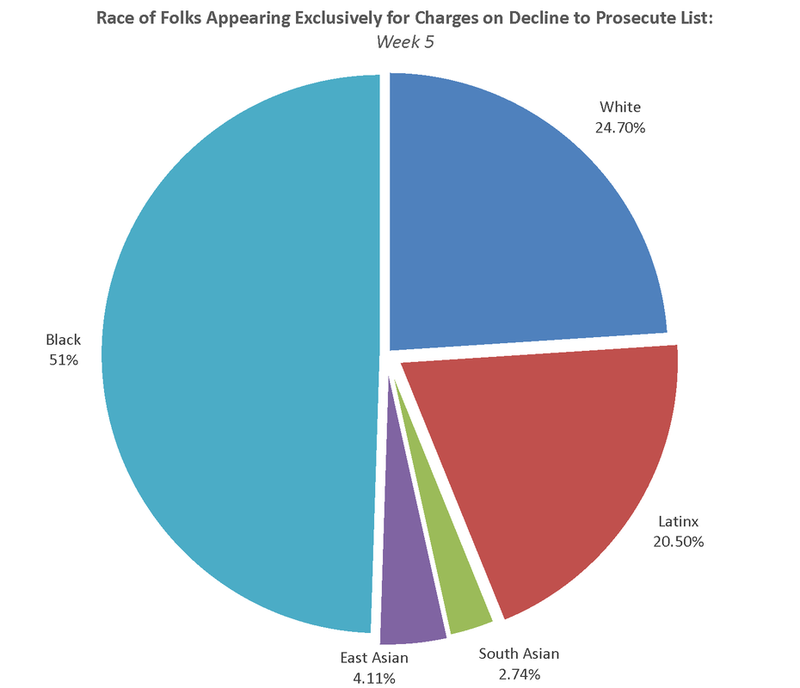 Courtwatchers noted demographics in only 51 of the 74 decline to prosecute cases. 41.18% Black, 23.53% Latinx; 35.29% white, 0% South Asian, and 1.96% East Asian. ​Black defendants are once again astronomically overrepresented compared to the population, while white defendants are starkly underrepresented. Each week we see a number of cases rooted in social or administrative issues that are frequently dismissed and which DA Rollins should consider adding to her pending list of charges to be declined. For example, 5 cases observed this week were for drinking in public, a minor ordinance violation, all of which were dismissed without conditions even when the individual was not present in court. We hope the forthcoming policy memo includes not only all of the charges DA Rollins identified on the campaign trail but also other petty offenses—including those we have highlighted over the past ten weeks (for example, failure to attend jury duty), in these digests and on twitter. On February 15th, a man appeared in Dorchester to resolve a default. He had been arraigned in July on assault and battery with a dangerous weapon, released on $400 bail. At that July appearance his next court date was scheduled for February 13, 2019. However, he was picked up by ICE at the courthouse and held for the last six months. Since he was held in immigration detention, he missed court on February 13th. The judge found his failure to appear constituted a default, issued a warrant, and found that the $400 bail he had paid in July should be forfeited. However, within 2 days of that default, this man came to court on his own with his attorney. He had just been granted asylum, meaning lawful residence in the U.S. on the basis of a credible fear of persecution if returned to his country of origin, and released from ICE custody. The judge acknowledged that no one knew he had been in ICE custody. The default was cleared; bail was reinstated; his next court date was scheduled for April. We tell this story for a few reasons. For one thing, this man’s case illustrates that so-called “failures to appear” may not reflect willful avoidance of court obligations; often, we see people with explainable impediments to showing up to court—for example, they were detained elsewhere; they lacked transportation to court; they face housing insecurity and never received a summons on the underlying charge. And yet defaults are used to enhance criminal consequences: a default on one’s record often encourages judges to set a higher bail or to issue a warrant when someone misses court in the future. The court system does not track data to determine how many “failures to appear” reflect actual “flight,” and yet the failure to appear boogeyman continues to take up an undue amount of space in ongoing conversations about bail reform—despite the fact that the failure to appear rate in Massachusetts is exceedingly low even with this confounded data. Second, we tell this story because of what it says about how our court system and state and local law enforcement continue to allow ICE to trample the rights of immigrants. This man was picked up at the courthouse. He was secreted away to detention without notifying the court system. He was not brought in for his next court appearance. ICE expects cooperation from our courts and law enforcement, meanwhile ICE denies immigrants the opportunity to vindicate their rights in court, prevents them from meaningful participation in their defense in pending criminal cases, and puts them in jeopardy of further heightened criminal penalties. DA Rollins promised to implement an ICE security policy within 30 days of taking office. Recent reporting demonstrates that the Boston Police Department continues to work collusively with ICE. Where is DA Rollins’ promised leadership to protect sanctuary in Suffolk County? As stated above, 39 cases involving only charges to be declined were not dismissed or diverted. Those cases should also be declined, and we hope that this will change in the weeks to come. Courtwatchers observed 6 cases involving charges from the decline to prosecute list in which an ADA asked for bail. We again emphasize that ADAs should always recommend release on personal recognizance in cases when the person is not a flight risk and should never request bail for charges on the do not prosecute list. Courtwatchers documented 10 cases this week involving charges from the decline to prosecute list in which ADAs asked for conditions instead of dismissing the case outright. Further, courtwatchers documented 17 decline to prosecute cases in which ADAs asked for release on personal recognizance—intentionally continuing the case as a criminal matter. Finally, we saw 1 case in which an ADA successfully requested that bail on a prior case be revoked for a person facing new charges of drug possession and resisting arrest, in addition to requesting bail on the new charges. Because his bail was revoked, this man will now be held for 60 days without the possibility of release. DA Rollins should monitor this practice among her ADAs and prevent this from happening again. Just as we advocate that bail should never be set on a charge to be declined, bail should likewise never be revoked in connection with a docket involving this set of charges. In all cases, we hope ADAs seek the least burdensome outcome that will resolve the case. For all 15 charges DA Rollins has identified, we believe cases should generally be dismissed without conditions. We applaud DA Rollins for delivering on this campaign pledge and implementing a significant procedural change that will act as an accountability check on SCDAO investigations of officer-involved shootings and provide an oversight mechanism when police use force. Local organizers, in particular survivors of loved ones murdered by police, have sought this change for years. We hope this is the first of many steps DA Rollins takes to be responsive to the needs of the community she represents. We have long passed DA Rollins’ own benchmark of six weeks, the time it took DA Larry Krasner in Philadelphia to issue his first policy memo. DA Rollins continues to speak publicly about the list of offenses she pledged to decline, her intent to implement policy, and her promise to review the policy and internal data after six months to see what is working. We appreciate her continued commitment to these goals—but each day that goes by without formal policy, the harms she rightly identified continue. Black people in Suffolk County were disproportionately charged with “Decline to Prosecute” offenses. Over the two-year period, Black people were three times more likely to be charged with trespass or resisting arrest than white people, and four times more likely to be charged with a motor vehicle offense—in one neighborhood, 15 times more likely. Black people were not only charged at higher rates: in many of the “Decline to Prosecute” categories, Black people were more likely to face an adverse disposition (e.g., admission to sufficient fact or conviction with a term of probation or incarceration). During that two-year period, the Suffolk County District Attorney’s Office prosecuted 55% of DTP cases to a non-adverse disposition. In other words, over half of the DTP cases prosecuted between 2013 and 2014 resulted in dismissals or acquittals. Even though a majority of these cases ultimately resolved without a criminal conviction or adverse finding, people often had to go through many months of pre-trial hearings before their cases were dismissed, which causes stress and strain particularly if people were incarcerated and/or low-income, hourly workers, and/or homeless. The ACLU analyzed dismissals and acquittals across the life of criminal cases, not only dismissals at arraignments. Therefore their findings are not a perfect comparator or baseline against which to measure our findings and the progress of the Rollins administration. Still, this snapshot demonstrates that DA Rollins has not improved upon her predecessor’s record when it comes to these minor offenses. In these weekly digests, we’ve published data analysis based on data collected by volunteers that mirrors the dismissal rate and racial disparities seen in the data from 2013-2014. ​We know that DA Rollins has met with a coalition of community groups working in these domains and her office has been provided with additional names, but there has been limited follow-up to advance community-led alternatives. We are publishing this digest late. We are now well into week 11 without substantive office policy. The charges DA Rollins pledged to decline continue to be criminally prosecuted; people continue to be held on cash bail in response to ADA requests; and the only data we have is the data our volunteers collect. All told, Suffolk County’s district courts continue to churn through minor cases and disrupt people’s lives with time in jail, punitive conditions, and unnecessary arrest warrants for court absences. Train ADAs on substantive policy changes and hold them accountable if they deviate from office policy. We’re waiting. And we’ll be watching. This week we again removed cases from our dataset representing status hearings, diversion check ins, restraining orders, probation violations, or other types of hearings that were not initial arraignments. We again note that the total number of hearings observed is not the total number of arraignments which transpired in those courts. For a more comprehensive count of arraignments, you can view sparse information about all criminal cases, by court and date of filing, at masscourts.org. Select the court, use the “case type” tab, select the relevant date(s), and select both “criminal” and “criminal cross site” as the case type. For the same period (February 13th to February 19th), a search on MassCourts reveals 116 cases out of BMC Central, 55 cases out of Roxbury, 67 cases out of Dorchester, and 23 cases out of East Boston, for a total of 261 cases filed this week in these courts. We note that this number also does not reflect the total number of cases arraigned in these courts; courtwatchers also observe arraignments of older dockets with some frequency. Because of limited capacity of the CourtWatch MA team, we again did not verify every case against the limited available charge information on masscourts.org. We have verified the charge in any case where the courtwatcher left the charge blank, did not hear the charge, or noted that reading the charge was waived in court. It is of course possible courtwatchers misheard the charge(s) in any given case; we reiterate that our data collection is not a substitute for open government. We remain cautiously optimistic that District Attorney Rollins will release data tracked by the Suffolk County District Attorney’s Office going forward, as she pledged during her campaign. At the outset, we want to acknowledge that our team is behind in releasing digests. CourtWatch MA is an all-volunteer effort and we are working diligently to make all of our data analysis public as soon as possible. 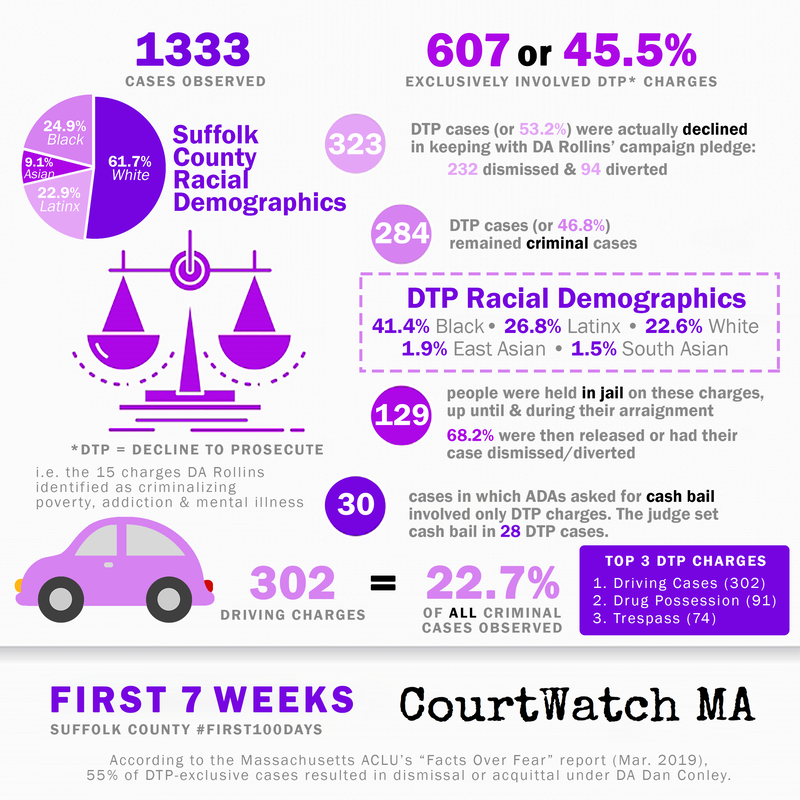 From February 6th to February 12th, our courtwatchers observed 201 cases at arraignment across three divisions of Boston Municipal Court (BMC Central, Roxbury, and Dorchester). This week, 44.8% of the cases we observed involved only charges that Suffolk County District Attorney Rachael Rollins has pledged to decline to prosecute, either by dismissing at arraignment or diverting through a non-criminal proceeding, program, or outcome. As we’ve seen every week since we began observing, this means almost half the cases we observed this week involved only crimes that District Attorney Rollins has identified as low-level, non-violent crimes rooted in poverty, mental illness, and addiction. There were 90 cases involving ONLY charges on the decline to prosecute list this week. 42.2% of these cases (38 cases) advanced as criminal matters. 38 of these cases were dismissed at arraignment. Therefore, a total of 52 cases, or roughly 57.7%, were declined within the meaning of DA Rollins’ campaign pledge. After six weeks of monitoring and analysis in three BMC courts, we again see that DA Rollins has not made significant strides to progressively implement her list of charges to be declined. We want DA Rollins to succeed in implementing her bold campaign pledge to decline to prosecute these minor offenses that comprise almost half of all criminal court dockets every week in the BMC courts where we observe. Our First 100 Days project aims to hold her accountable precisely because we are excited at the prospect of transformation for our courts and our communities. More than 60 days into her administration, we remain concerned about when policies will be issued and implemented. Both in the press and in meetings with community members, DA Rollins’ office continues to promise that much-anticipated changes are coming. Compared to the rollout of policy by her peers—whether Larry Krasner in Philadelphia, Wesley Bell in St. Louis, or Andrea Harrington in Berkshire County, MA—DA Rollins has fallen behind. We are more than halfway through the First 100 Days. Her office remains without policy, even though DA Rollins has spoken publicly about the fact that as a District Attorney she is not hampered by any legislative body and can act swiftly as an executive to enact her vision. For the sixth week in a row, the majority of dismissals were driving cases – 23 of the 38 cases (60.5%) that were dismissed. The other 15 cases dismissed at arraignment were incidents of trespass (9), shoplifting (1), disorderly conduct (2), wanton or malicious destruction of property (1), and drug possession (2). In a trespass case, the man being arraigned had a default on the charge from January, but still the ADA asked for a dismissal conditioned on eight community service hours already completed. The judge dismissed in view of that prior service and without further conditions, but specified that the dismissal was post-arraignment because this person has a history of multiple trespass charges. A post-arraignment dismissal means charges will appear on a person’s records and they will have to answer ‘yes’ if they are ever asked if they have been charged with a crime. In a shoplifting case, the ADA asked for release on personal recognizance, but the judge dismissed it outright. In a drug possession case, the young Black man being arraigned had been enrolled in detox and the Salvation Army treatment program, but had a seizure while there and was transferred to a hospital for care. He was taken into custody because probation did not realize that he had entered into the treatment program. The ADA asked to dismiss pre-arraignment, which the judge approved. We have coded these cases as outright dismissals because the individuals were not required to report back to court on a future date and the charges were dismissed. However, the fact that a judge in one case counted prior community service as “time served” and the dismissal was post-arraignment complicates this categorization. As we discussed at length last week, while it’s appropriate that these cases were dropped, any time spent in detention is harmful. ADAs should stop bringing these charges altogether, or at the very least, ask that judges dismiss these cases outright. Over the past six weeks we have seen very few outright dismissals for most of the charges on DA Rollins’ list. Even when a handful of cases involving drug possession or trespass or shoplifting charges were dismissed, usually many more of those charges remained criminal cases. For example, this week only 2 out of 15 possession charges were dismissed and 2 were diverted. That means 73.3% of this week’s possession cases proceeded as criminal matters. Years of public health research has confirmed that “[t]he risk of overdose death after release from correctional facilities has been shown to be more than 10 times the risk in the general population.” And yet ​the police have the most resistance to dismissing possession and possession with intent to distribute cases, which besides driving offenses are also among the most populous charge categories on DA Rollins’ list to decline. These decisions are especially important to shifting the punitive culture of the courts. Abundant public health research identifies the risks and costs of trying to prosecute our way out of the opioid crisis, and DAs who chose to follow science instead of fear-mongering have seen dramatic, life-saving results. A majority of driving cases (73.2%) were declined this week at arraignment. Undocumented people are particularly vulnerable when arrested and arraigned on driving charges. It is our hope that declining to prosecute all driving charges will disincentive arrest so driving matters can be handled civilly like they are in many predominantly white suburbs. We categorize any dismissal that included conditions requiring a future court appearance as a diverted case in an effort to more accurately represent the data we collect. This week 14 cases were diverted. Every disposition involved at least one condition, like treatment; a court fee; community service; or probation. ADAs usually refer to these cases as “conditional dismissals,” but individuals were generally required to report back to court at least once on a future date to prove compliance with the condition. Additional appearances cause stress and strain on families that could be avoided by outright dismissals. Much like dismissals, half of the diversions were driving cases – 7 of the 14 (50%) cases diverted this week. For driving cases, judges usually gave the person an option of returning with proof of license/registration/insurance, paying a fee between $50 and $150, completing community service, or enrolling in driving school. The case of larceny under $1200 which was referred to probation for a diversion evaluation was charged against a 20-year-old high school student. A legislative Task Force is currently evaluating raising the age of juvenile court jurisdiction to include emerging adults ages 18 to 20, consistent with a vast body of neuroscience research about brain development among juveniles and young adults. Especially because this individual is so young and should be encouraged to focus on school, additional conditions and obligations may do more harm than good. DA Rollins should reconsider whether diversion is truly preferable to dismissal in all cases, but especially a case like this. We also note that, though DA Rollins emphasized during her campaign the need to get people access to services, not hand down sentences, we often see punitive conditions (court costs and community service hours) to address what DA Rollins has identified as root causes in many cases like these: poverty, addiction, and mental illness. Especially in theft cases, where poverty or addiction may be a primary driving factor of the underlying conduct, imposing even a $150 fee can prolong someone’s court involvement and compound their hardship, keeping them off the path to stability or recovery. In other cases, defense attorneys may file motions to waive such fees and prosecutors may agree or recommend to the judge that the fees be waived. Finally, as we have said before, completing community service within the requisite timeframe may mean people need to call out of or cancel work, miss classes, or arrange childcare. Though many judges allow individuals to do community service at a place of their choice, some mandate that individuals serve through the state-run program that requires manual labor and is only offered on certain days. It’s important to note that this kind of community service has no restorative value and is imposed before a person has been convicted of any wrongdoing. Pre-arraignment community service is simply a punishment for being arrested. In 17 cases that advanced as criminal matters, the person being arraigned was released on personal recognizance. In many such cases, the court also imposed conditions—especially common was a stay away or no contact order for the place of the incident or a person involved. Sometimes a person is required to stay away from their own home or a major transit hub through which they have to commute. In 4 cases exclusively involving charges DA Rollins pledged to decline this week, bail was set. Bail amounts ranged from $100 to $400. In 2 of these 4 cases, the individual being arraigned was facing charges of drug possession and/or possession with intent to distribute. We’ve seen repeatedly that the Suffolk County District Attorney’s Office continues to treat drug charges like these as a serious crime, even though they are among the charges to be declined. In the remaining 17 cases, we don’t know the final release decision or case outcome because the arraignment was continued—i.e. postponed to a future date or time (5 cases), the person being arraigned remained detained (despite the judge deciding to release them on personal recognizance on the pending charges) in order to resolve a warrant in another court (1 case), the person did not appear for arraignment and a warrant was issued (8 cases), the person had their bail revoked on a prior case and was held for transport to another court (1 case), or the courtwatcher wasn’t sure what happened (2 cases). We note that people not showing up for arraignment happens rarely, and that courts don’t have to verify that a person actually received a summons before issuing an arrest warrant—a disturbing practice we hope DA Rollins will push to change. Our observed non-appearance rate among these minor charges was 8 cases out of 90, a rate of just 8.9%. In two of the cases this week in which bail was set at arraignment, the judge simply reaffirmed what the bail magistrate had already imposed, which the person had already posted. 5 had their cases dismissed. The remaining 4 people were assessed bail (1), held for transport to another court for an open warrant (1), held for transport to another court for an open warrant with bail revoked on a different case (1), or the case was continued (1). In other words, 11 people spent time in jail and ultimately were not prosecuted or were released; they were detained without an ability to shower, change clothes, see their kids, walk their pets, take their medications, or communicate with their jobs or families—only to have a judge determine there was no good reason to detain them. Further, this means in 73.3% of cases in which a bail magistrate declined to release someone this week, the judge released the individual or diverted or dismissed that person’s case. After 6 weeks of observing this phenomenon, our data support our assertion that clerks set bails too often and too high at police stations. 54.69% Black, 17.19% Latinx; 29.69% white, 0% South Asian, and 0% East Asian. ​Black defendants are once again astronomically overrepresented compared to the population (this week by a factor of 2:1), while white defendants are starkly underrepresented. Each week we see a number of cases rooted in social or administrative issues that are frequently dismissed and which DA Rollins should consider adding to her pending list of charges to be declined. For example, 6 cases observed this week were for drinking in public, a minor ordinance violation; 3 cases this week were for juror failure to appear. All 9 of these cases, representing roughly 5% of all criminal cases observed this week, were dismissed. Without question, these cases should not be prosecuted. If a person misses court, even on a minor charge, ADAs continue to ask for judges to issue a warrant. A minor charge plus a missed court date should not subject someone to arrest or even jail. At the very least, ADAs should dismiss these charges pre-arraignment; ideally they should stop bringing these charges altogether. As stated above, 38 cases involving only charges to be declined were not dismissed or diverted. Those cases should also be declined, and we hope that this will change in the weeks to come. Courtwatchers observed 4 cases involving charges from the decline to prosecute list in which an ADA asked for bail. We again emphasize that ADAs should always recommend release on personal recognizance in cases when the person is not a flight risk and should never request bail for charges on the do not prosecute list. Courtwatchers documented 30 cases this week involving charges from the decline to prosecute list in which ADAs asked for conditions instead of dismissing the case outright. Further, courtwatchers documented 17 decline to prosecute cases in which ADAs asked for release on personal recognizance—intentionally continuing the case as a criminal matter. Finally, we saw 1 case in which an ADA successfully requested that bail on a prior case be revoked for a person facing new charges of trespass, threats, drug possession with intent to distribute, and resisting arrest. Because his bail was revoked, this man will now be held for 60 days without the possibility of release. We acknowledge that the ADA did not request bail on the new charges, but he did demand that this man facing charges exclusively on the decline to prosecute list spend 2 months in jail pre-trial, without any safety valve for release. DA Rollins should monitor this practice among her ADAs and prevent this from happening again. Just as we advocate that bail should never be set on a charge to be declined, bail should likewise never be revoked in connection with a docket involving this set of charges. “‘There is no control of the power that a DA has,’ said Rollins, excepting the vote of the people. Compare that to a mayor who faces a city council, or a governor who works with and against a state legislature, and Rollins said she has an unusual ability to enact reforms quickly. Despite public posturing on quick reforms and public pledges on specific policies—an ICE security policy in place within 30 days; a memo last month on charges to be declined; bail policy—there have been no publicly issued policies. We have long-passed DA Rollins’ own benchmark of six weeks, the time it took DA Larry Krasner in Philadelphia to issue his first policy memo. We are publishing this digest late; we are now well into week 9 without any office policy. DA Rollins has done little to disrupt the status quo in Suffolk County’s district courts, which continue to churn through minor cases and disrupt people’s lives with time in jail, punitive conditions, and unnecessary, knee-jerk arrest warrants for court absences. The Suffolk County District Attorney’s Office is still actively prosecuting people for the 15 crimes DA Rollins pledged to decline. DA Rollins knowingly continues to criminally prosecute these cases. It is difficult to square her public statements with the reality of what is happening in our courts. In many cases folks face court costs or community service hours to resolve their cases and are given future court appearances to prove compliance. We have now published six weeks of data analysis. As of our date of publication, DA Rollins has already been in office for more than eight weeks. She ran on a platform of transparency and she has spoken candidly about supporting CourtWatch and the push for accountability, yet we have seen (1) no published data from the SCDAO; (2) no policy; and (3) no training for ADAs. Further, we know that her office is not presently tracking data to be able to remedy the harm done over her first 2 months. DA Rollins recently announced that her office will be holding quarterly town halls to share reports out of the office, answer community questions, and take suggestions. The first town hall is scheduled for March 28, 2019. This effort at transparency and community engagement is a positive step, but if DA Rollins aims to run a transparent office she must: (1) publish SCDAO internal data, (2) publicly issue office policy, and (3) put in place a plan to make policy retroactive by revisiting all prosecutions her office undertook over her first two months. This week we again removed cases from our dataset representing status hearings, diversion check ins, restraining orders, probation violations, or other types of hearings that were not initial arraignments. We again note that the total number of hearings observed is not the total number of arraignments which transpired in those courts. For a full count of arraignments, you can view sparse information about all criminal cases, by court and date of filing, at masscourts.org. Select the court, use the “case type” tab, select the relevant date(s), and select both “criminal” and “criminal cross site” as the case type. For the same period (February 6th to February 12th), a search on MassCourts reveals 111 cases out of BMC Central, 72 cases out of Roxbury, and 97 cases out of Dorchester, for a total of 280 cases filed this week. We note that this number also does not reflect the total number of cases arraigned in these courts; courtwatchers also observe arraignments of older dockets with some frequency. From January 30th to February 5th, our courtwatchers observed 192 cases at arraignment across three divisions of Boston Municipal Court (BMC Central, Roxbury, and Dorchester). This week, 41% of the cases we observed involved only charges that Suffolk County District Attorney Rachael Rollins has pledged to decline to prosecute, either by dismissing at arraignment or diverting through a non-criminal proceeding, program, or outcome. As we’ve seen every week since we began observing, this means almost half the cases we observed this week involved only crimes that District Attorney Rollins has identified as low-level, non-violent crimes rooted in poverty, mental illness, and addiction. 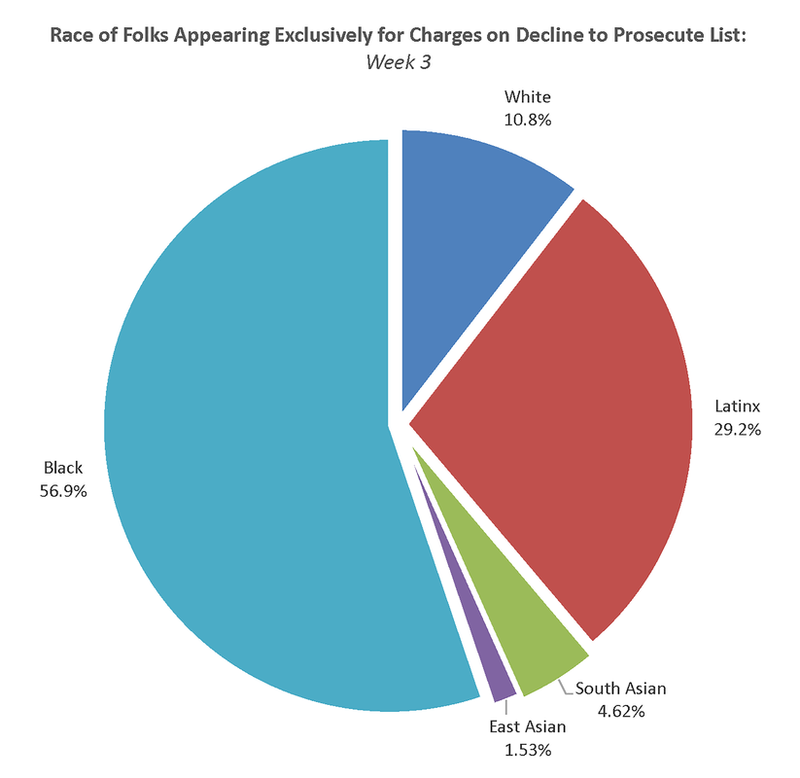 There were 79 cases involving ONLY charges on the decline to prosecute list this week. 58% of these cases (46 cases) advanced as criminal matters. 18 of these cases were dismissed at arraignment. Our datasets from week to week are relatively small, so we don’t want to dwell on the fact that, compared to weeks prior, a noticeably larger number of cases remained criminal cases this week. This week’s anecdotal findings suggest that things have, at best, plateaued, and perhaps gotten worse. However, we can confirm a disappointing finding: things aren’t getting better. After five weeks of monitoring and analysis, we conclude that DA Rollins has not made any significant strides to progressively implement her list of charges to be declined. We want DA Rollins to succeed in implementing her bold campaign pledges; our First 100 Days project aims to hold her accountable precisely because we are excited at the prospect of transformation for our courts and our communities. February 21st marks 50 days in office. We are halfway through the First 100 Days. The absence of policy and the lack of transparency to date deeply concern us. For the fifth week in a row, the majority of dismissals were driving cases – 12 of the 18 cases (67%) that were dismissed. The other 6 cases dismissed at arraignment were incidents of larceny under $1200 and threats (1), shoplifting (2), drug possession (2) and drug possession with intent to distribute (1). Both of the shoplifting cases were dismissed after the individuals had spent at least one night in jail, and the judge found community service “deemed served” based on the time spent locked up pre-arraignment. In one case, the man had spent 18 hours locked up; in the other, the woman had spent two days in jail for shoplifting chocolate from a CVS. The courtwatcher also noted that she has a serious addiction, and her circumstances were likely exacerbated by her time in jail. Though we have coded these cases as outright dismissals because the individuals were not required to report back to court in the future and the charges were dismissed, the fact that a judge essentially counted each defendant’s pre-arraignment detention as “time served” to satisfy diversion complicates how we categorize these cases. We also note that these were two different judges, two different courts, and two different days. This is not just one judge’s anomalous practice. While it’s appropriate that these cases were dropped, the time they spent in detention is harmful. On top of that, it is troubling that judges equate community service with the travesty of unwarranted unnecessary pre-arraignment incarceration. It’s alarming that judges impose any conditions when cases should be dismissed and even more upsetting that both judges and clerks aren’t doing more to prevent overnight and weekend-long detention for misdemeanors and low-level felonies. The ultimate problem here is that detention, rather than release, continues to be the default in Suffolk County. Though we have written about how burdensome conditions of diversion can be, they simply are not equivalent to the trauma and destabilizing force of days spent in jail. We think judges should simply dismiss these cases outright, without relying on improper and unnecessary pretrial detention to justify subsequent dismissal. These folks never should have been jailed to begin with, and these charges never should have been brought. Dismissing these charges in exchange for time spent in jail is anathema to the plain meaning of a policy of declining to prosecute and exposes that diversion may not always be harm reduction. 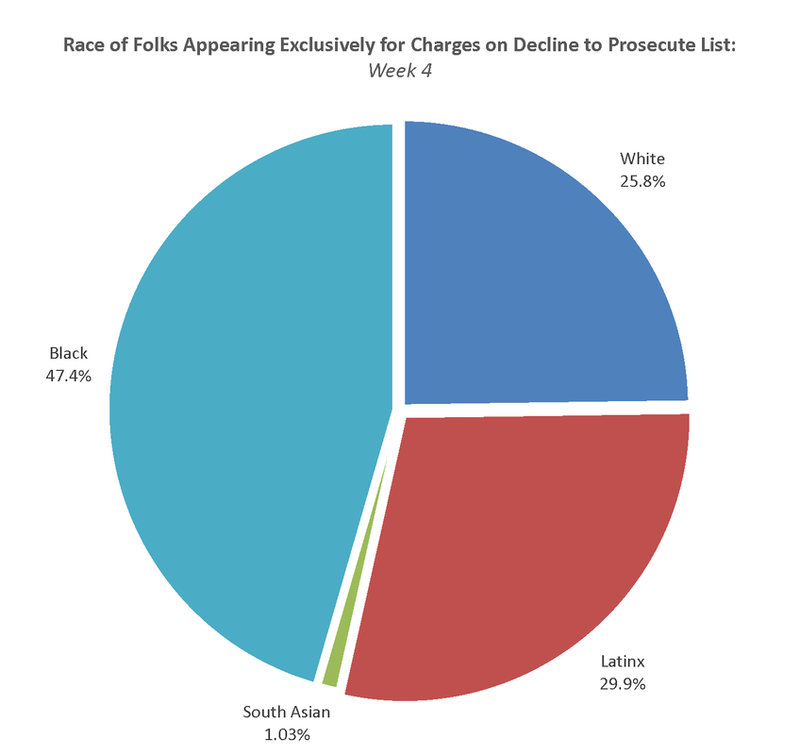 We note that the police have the most resistance to dismissing possession and possession with intent to distribute cases, which besides driving offenses also happen to be the most populous charge categories on DA Rollins’ list to decline. These decisions are especially important to shifting the punitive culture of the courts. Abundant public health research identifies the risks and costs of trying to prosecute our way out of the opioid crisis, and DAs who chose to follow science instead of fear-mongering have seen dramatic, life-saving results. ​A majority of driving cases (57.5%) were declined this week at arraignment. Undocumented people are particularly vulnerable when arrested and arraigned on driving charges. It is our hope that declining to prosecute all driving charges will disincentive arrest so driving matters can be handled civilly like they are in many predominantly white suburbs. This week 15 cases were diverted. Every disposition involved at least one condition, like treatment; a court fee; community service; or probation. ADAs usually refer to these cases as “conditional dismissals,” but individuals were generally required to report back to court at least once on a future date to prove compliance with the condition. Additional appearances cause stress and strain on families that could be avoided by outright dismissals. Much like dismissals, the vast majority of diversions were driving cases – 11 of the 15 (73.3%) cases diverted this week. For driving cases, judges usually gave the person an option of returning with proof of license/registration/insurance, paying a fee between $50 and $150, or completing 4 to 12 hours of community service. In one driving case, the man being arraigned in Dorchester was held on a straight warrant on an underlying charge of driving without a license. Judge Georges asked him how long he had been in jail. He had been held since 11:00 AM the day before. The ADA offered diversion: payment of a fine of $250 or 12 hours community service. Faced with these options, he was going to choose community service, but the judge made it a $10 fee and pointedly said it was for a civil matter. The judge implied this case should be a civil not a criminal matter, but prosecutors still seek criminal punishments, however minor. This was not the only instance observed this week in which an ADA asked for an additional condition, like a fine or more than a full day’s work of community service hours, on a “charge to be declined” even after the person was held in jail. As a reminder, completing community service within the requisite timeframe may mean people need to call out of or cancel work, miss classes, or arrange childcare. Though many judges allow individuals to do community service at a place of their choice, some mandate that individuals serve through the state-run program that requires manual labor and is only offered on certain days. In 31 cases that advanced as criminal matters, the person being arraigned was released on personal recognizance. In many such cases, the court also imposed conditions—especially common was a stay away or no contact order for the place of the incident or a person involved. Sometimes a person is required to stay away from their own home or a major transit hub through which they have to commute. In 5 cases exclusively involving charges DA Rollins pledged to decline this week, bail was set. Bail amounts ranged from $100 to $1000. In 3 of these 5 cases, the individual being arraigned was facing charges of drug possession and/or possession with intent to distribute. We’ve seen repeatedly that the Suffolk County District Attorney’s Office continues to treat drug charges like these as a serious crime, even though they are among the charges to be declined. One case this week exemplified the disturbing practices of overcharging, asking for bail people can’t afford, and criminalizing marijuana which is a legal drug. The ADA requested $500 bail, but the judge released the young man on personal recognizance. We can say without hesitation that he was profiled, as the original reason for stopping him ultimately did not become a criminal charge in his case. He was driving, an officer determined (only after he was pulled over) that his insurance had lapsed, and he volunteered that he had marijuana in his trunk. The officer found a digital scale with the marijuana and a small amount of cocaine on his person, which he explained was for personal use. He was charged with possession and possession with intent to distribute for both substances. In addition to $500 bail, the ADA asked for an order to remain drug and alcohol free, even though alcohol was totally irrelevant to the charges. He was released on personal recognizance. In the remaining 10 cases, we don’t know the final release decision or case outcome because the arraignment was continued—i.e. postponed to a future date or time (3 cases), the person being arraigned remained detained (despite the judge deciding to release them on personal recognizance on the pending charges) in order to resolve a warrant in another court (3 cases), the person did not appear for arraignment and a warrant was issued (1 case), or the courtwatcher wasn’t sure what happened (3 cases). We note that people not showing up for arraignment happens rarely, and that courts don’t have to verify that a person actually received a summons before issuing an arrest warrant—a disturbing practice we hope DA Rollins will push to change. As a point of interest, though the tallies of drug possession and drug possession with intent to distribute charges seem similar from week to week, they rarely overlap much. This week only three cases involved charges of both drug possession and drug possession with intent to distribute. 3 had their case dismissed. The remaining 6 people were assessed bail (3), held for transport to another court for an open warrant (2), or the courtwatcher was uncertain of the outcome (1). Further, this means in 73.9% of cases in which a bail magistrate declined to release someone this week, the judge released the individual or diverted or dismissed that person’s case. 51% Black, 20.5% Latinx; 24.7% white, 2.74% South Asian, and 4.1% East Asian. As we saw in weeks 2 and 4, a number of the cases this week that involved charges besides or in addition to the DTP charges were other minor offenses—just ones that DA Rollins did not pledge to decline. For example, 10 of the cases involved default removals—clearing up a prior absence from court or inability or failure to pay a fine, fee, or restitution. This week 20 cases we observed were criminal charges leveled against people for failing to attend jury duty, many of whom were actually ineligible to serve (e.g. not U.S. citizens). That means more than 10% of all cases observed this week, and roughly 18% of non-DTP cases, were criminal charges for failure to appear for jury duty. In all of these cases, even if the defendant was not present, the charges were uniformly dismissed. Much like last week, 4 cases observed this week were for drinking in public, a minor ordinance violation. All 4 cases were dismissed. As a point of comparison, we also observed only 4 cases involving a firearm this week, compared to 79 cases involving only charges to be declined. As stated above, 46 cases involving only charges to be declined were not dismissed or diverted. Those cases should also be declined, and we hope that this will change in the weeks to come. Courtwatchers documented 12 cases this week involving charges from the decline to prosecute list in which ADAs asked for conditions instead of dismissing the case outright. Further, courtwatchers documented 21 such cases in which ADAs asked for release on personal recognizance—intentionally continuing the case as a criminal matter. Despite public pledges—to have an ICE security policy in place within 30 days; to issue a memo this month on charges to be declined—there have been no publicly issued policies. We have now passed DA Rollins’ own benchmark of six weeks, the time it took DA Larry Krasner in Philadelphia to issue his first policy memo. Last week we highlighted a number of jurisdictions around the country with bail policy; some of these policies have been in place for more than a year. Just today, the Philadelphia District Attorney’s Office and academics released a report finding that the policy had a tremendously positive effect: reducing the pre-trial jail population without increasing recidivism or making it more likely people would miss their court dates. Indeed, a memo alone can create change. Nevertheless, DA Rollins’ office still has no bail policy. We continue to see ADAs request bail for charges that criminalize addiction and compound racial disparities in Suffolk County, despite the rhetoric of seeking “services not sentences” and working to make the system fair. Even as she maintains a packed slate of public appearances and speaks passionately about her campaign promises, DA Rollins remains a steward of the status quo in Suffolk County. The Suffolk County District Attorney’s Office is still actively prosecuting people for the 15 crimes DA Rollins pledged to decline. In many cases folks face court costs or community service hours to resolve their cases and are given future court appearances to prove compliance. Based on the information we have gathered and recent reporting, DA Rollins knowingly continues to criminally prosecute these cases. It is difficult to square her public statements with the reality of what is happening in our courts. We have now published five weeks of data analysis. As of our date of publication, DA Rollins has already been in office for more than six weeks. She ran on a platform of transparency and she has spoken candidly about supporting CourtWatch and the push for accountability, yet we have seen (1) no published data from the SCDAO; (2) no policy; and (3) no training for ADAs. To put it mildly, her constituents are both disillusioned and disappointed. DA Rollins can renew public trust with a public release of office policy and SCDAO internal office data. We’re waiting. And we’ll be watching. This week we again aimed to remove cases from our dataset representing status hearings, diversion check ins, restraining orders, probation violations, or other types of hearings that were not initial arraignments. We again note that the total number of hearings observed is not the total number of arraignments which transpired in those courts. For a full count of arraignments, you can view sparse information about all criminal cases, by court and date of filing, at masscourts.org. Select the court, use the “case type” tab, select the relevant date(s), and select both “criminal” and “criminal cross site” as the case type. For the same period (January 30th to February 5th), a search on MassCourts reveals 93 cases out of BMC Central, 58 cases out of Roxbury, and 79 cases out of Dorchester, for a total of 230 cases this week. From January 16th to January 22nd, our courtwatchers observed 161 people facing charges at arraignment across three divisions of Boston Municipal Court (BMC Central, Roxbury, and Dorchester). This week, slightly more than half of the cases observed (50.9%) involved only charges that Suffolk County District Attorney Rachael Rollins has pledged to decline to prosecute, either by dismissing at arraignment or diverting through a non-criminal proceeding, program, or outcome. Again, that means half of the cases we observed this week represented crimes that District Attorney Rollins has identified as low-level, non-violent crimes rooted in poverty, mental illness, and addiction. We want to mention up front that 34.7% of all 161 cases observed this week were driving charges. In other words, 35% of criminal dockets this week in these BMC courts were essentially aggravated traffic court—judges overseeing, and often diverting or dismissing, driving offenses for which folks are still frequently arrested and occasionally held in jail. This concerns us. We hope lawmakers take note. From this point forward we are only going to categorize cases that are dismissed outright as dismissals. Cases that are conditionally dismissed – with court costs, community service hours, or a treatment program – and therefore require a subsequent appearance in court will be considered diverted cases. We think this is both more accurate and more useful coding. As addressed in detail below, we are concerned about the impact that imposing conditions which require time, money, or transportation will have on poor and working class people facing charges. There were 82 cases involving ONLY charges on the decline to prosecute list this week. 37.8% of these cases (31 cases) advanced as criminal matters. 33 of these cases were dismissed at arraignment. Therefore, a total of 51 cases, or roughly 62.2%, were declined within the meaning of DA Rollins’ campaign pledge. For the 18 diverted cases, the disposition involved at least one condition, like treatment; a court fee; community service; or probation. In these cases, which ADAs usually refer to in court as conditional dismissals, individuals were required to report back to court on a future date to prove compliance with the condition. When a person pays a fee to the court or serves community service through the state program administered by the probation department, the court should be able to verify compliance with that condition on its own. Instead, our courts insist that people appear in court again, not only requiring them to take time off work, school, or parenting, or pay for transportation to make it there, but also potentially setting up a new cycle of criminal appearances if for some reason they are unable to appear in court that day. If a person “fails to appear” in court, that becomes a default on their record. A default on your record can easily become an open warrant; indeed, courtwatchers saw that happen four (4) times this week. Imagine being arrested and held in jail for a weekend because of a $100 fee the system thinks is unpaid (whether or not you already paid it) because you were in the hospital and therefore missed your last court date to prove compliance. Any new open warrant is just a drop in the bucket among the 390,000 open warrants in Massachusetts, but one that can have devastating consequences and can lead to debt-based jail time for the people caught up. For the third week in a row, the vast majority of dismissals were driving cases – 28 of the 33 cases (84.8%) that were dismissed. The other 5 cases dismissed at arraignment were incidents of: Trespass (3); Disorderly Conduct (1); and Drug Possession (1). ​A substantial majority of driving cases (76.8%) were declined this week at arraignment. Much like dismissals, the vast majority of diversions were driving cases – 15 of the 18 (83.3%) cases diverted this week. For driving cases, judges usually gave the person an option of returning with proof of license/registration/insurance, paying a fee between $50 and $150, or completing 4 to 12 hours of community service. The precise outcome depended on the judge. In 15 cases that advanced as criminal matters, the person being arraigned was released on personal recognizance. In many such cases, the court also imposed conditions—especially common was a stay away or no contact order for the place of the incident or a person involved. There were 3 cases this week, all involving drug possession, in which an ADA asked for bail but the judge released the individual on personal recognizance. Once again, we see that ADAs often asked for bails equal to or higher than what the judge ultimately imposed. We are not sure whether DA Rollins has given her ADAs a clear directive on not seeking bail for these 15 charges; as points of comparison, Wesley Bell in St. Louis County had day-one interim policy, whereas DA Larry Krasner in Philadelphia released his bail policy in an internal memo dated February 15th, about six weeks into his term. The man being arraigned was a passenger in a vehicle that was pulled over for broken tail lights and plate lights. Police ran a check on his ID and found an open warrant, then searched him and found 11 rock-like substances believed to be crack cocaine. The search did not reveal additional drug paraphernalia on his person. He admitted to being a drug user and is being charged with Class B possession with intent to distribute. As a reminder, intent to distribute is a judgment call the ADA makes and is not based on a weight limit. The ADA asked for $500 cash bail and transport to BMC Central for a warrant recall, noting that he had multiple defaults. The defense noted that he was not employed and would be unable to afford bail. Also, the probation warrant was the result of him voluntarily contacting probation himself to inform them of his release from a program. The judge did not set bail, releasing the man on personal recognizance, and scheduled a probable cause hearing for March. In another case where a man was charged with Class B drug possession, the ADA asked for bail to be revoked on another case, $300 bail to be set on the possession charge, and that the man be required to abstain from alcohol. The judge released the man on personal recognizance with the condition of alcohol abstention. In a third case where a man was charged with both drug possession and possession with intent to distribute, the ADA asked for a stay away order and $1500 bail. The judge released him on personal recognizance with an order to stay away from his codefendant. This man’s codefendant was arraigned on more serious charges, including possession of a stolen, loaded gun. For him, the ADA asked for and the judge set $25,000 bail, a GPS, a stay away order, and a curfew—despite his defense attorney advocating for release given his strong ties to the community. As a reminder, bail is only supposed to ensure one’s appearance in court and judges are required to consider a person’s ability to pay, regardless of the seriousness of the alleged crime. This week in only 1 case exclusively involving charges DA Rollins pledged to decline, bail was set. The judge set a $500 bail on a driving charge. In the remaining 15 cases, we don’t know the final release decision or case outcome because the arraignment was continued—i.e. postponed to a future date or time (6 cases), the person being arraigned remained detained (despite the judge deciding to release them on personal recognizance on the pending charges) in order to resolve a warrant in another court (3 cases), the person failed to appear for arraignment and a warrant was issued for their arrest (4 cases), or the courtwatcher left before the disposition was announced (2 cases). 3 had their cases dismissed (charges were trespass & disorderly conduct; trespass & resisting arrest; a driving charge). The remaining 4 people were held for transport to another court for an open warrant (3) or had their case continued (1). In other words, 12 people spent time in jail and ultimately were not prosecuted or were released; they were detained without an ability to shower, change clothes, see their kids, walk their pets, take their medications, or communicate with their jobs or families—only to have a judge determine there was no good reason to detain them. Further, this means in 75% of cases in which a bail magistrate declined to release someone, the judge released the individual or diverted or dismissed that person’s case. 56.9% Black, 29.2% Latinx; 10.8% white, 4.6% South Asian, and 1.5% East Asian. ​​Black and Latinx defendants are once again starkly overrepresented compared to the population, while white defendants are starkly underrepresented. As stated above, 31 cases involving only charges to be declined were not dismissed or diverted. Those cases should also be declined, and we expect this to change in the weeks to come. Courtwatchers observed 3 cases involving charges from the decline to prosecute list in which an ADA asked for bail but the judge ultimately released the individual on personal recognizance. We again emphasize that ADAs should always recommend release on personal recognizance in cases when the person is not a flight risk and should never request bail for charges on the do not prosecute list. There were also instances this week in which an ADA asked for conditions and the judge overruled the ADA and dismissed the case outright. In all cases, we hope the ADA asks for the least burdensome outcome that will resolve the case. For all 15 charges DA Rollins has identified, we believe the cases should generally be dismissed without any conditions. We were very concerned this week that so many warrants were issued when a person did not appear in court. In 4 cases ADAs asked for warrants to be issued and the judge obliged. We encourage DA Rollins to train ADAs to scrutinize whether a default reflects a willful failure to appear, or if instead there may be another explanation to excuse a person’s absence from court. We often see people who did not appear in court because of housing insecurity (they never got the summons) or who were unable to appear because of a hospital stay or commitment to a treatment program. Being arrested is a traumatic experience for anyone, and DA Rollins should do what she can to minimize arrests. Overall, failure to appear rates remain incredibly low—and studies show that they can be lowered further by redesigning confusing summons notices and sending text message reminders. Comparing each week to the week before, we have noticed more cases involving the 15 charges being declined and fewer cases continuing as criminal matters. This is a positive trend line. We hope it is not an anomaly but instead the result of ADAs learning how to apply District Attorney Rollins’ policy to decline the 15 crimes she has identified as criminalizing poverty, addiction, and mental illness. Still, as this week’s findings again demonstrate, her office is still actively prosecuting people for these crimes. As we see this week from our careful sifting of dismissed and diverted cases, in many cases folks face court costs or community service hours to resolve their cases and are given future court appearances to prove compliance. We remain deeply concerned about ADAs requesting and judges imposing conditions. DA Rollins recognizes that these 15 offenses criminalize poverty. Forcing someone to pay court costs as a condition before dismissal is counterproductive. If someone can’t make bail – which is refundable – will they be able to pay off court fees? In many cases, the reason for the underlying issue is purely economic. For example, we see so many driving cases in which someone’s license was suspended because of an unpaid fee, whether $6,000 owed to the IRS or outstanding child support. In order to resolve their diverted case, they’ll have to resolve the debt or get on a payment plan as well as pay their court costs and a license reinstatement fee. And if they don’t? A new default, a new warrant, perhaps a weekend in jail. In cases when it appears the judge is being lenient, poor and working class people may still struggle to meet expensive or time-consuming conditions that have no public safety benefit. We hope DA Rollins will encourage ADAs to think carefully about ability to pay not only when requesting bail—which lawfully can only be imposed to encourage someone to appear in court for future appearances—but also when (1) imposing conditions of dismissal and (2) seeking a default or warrant instead of a continuance that merely postpones and reschedules the arraignment. For example, this week a man was arraigned on charges of trespass & receiving stolen property who also had a default on his record. His attorney explained that he had been in the hospital during that earlier court hearing which caused the default. Nevertheless, he had to pay a $50 fee to remove the default. Finally, we look forward to a public release of office policy and SCDAO internal office data. ​DA Rollins has been in office for more than 3 weeks. The electorate is concerned and deserves to know what’s happening behind closed doors. This figure reflects four days of hearings because Monday, January 21st was a court holiday for Martin Luther King, Jr., Day. This week we took special care to remove nine (9) cases from our dataset representing status hearings, restraining orders, or other types of hearings that were not initial arraignments. We again note that the total number of hearings observed is not the total number of arraignments which transpired in those courts. For a full count of arraignments, you can view sparse information about all criminal cases, by court and date of filing, at masscourts.org. Select the court, use the “case type” tab, select the relevant date(s), and select both “criminal” and “criminal cross site” as the case type. For the First 100 Days project, courtwatchers are trained to listen for specific information focused on charging and bail decisions. We created a single-page form courtwatchers can use to track this information for each hearing they observe. The data is later uploaded through an online form, so we advise courtwatchers that they may take notes however they like, provided they capture the information we’re tracking for each hearing they watch. Courtwatchers are asked to enter their data directly into an online form themselves after each shift, preferably within 24 hours of observation. We’ve provided instructions on how to use the form. This method resolves issues with accuracy, capacity, and timeliness. Time and workloads don’t allow our three-person steering team to do data entry across hundreds of arraignments each week. The courtwatcher only has to read their own handwriting and recall their own experience, and given the turnaround time the memory is still fresh in their mind. And this efficient, people-powered method enables us to track and release data in real time on twitter and in the weekly digest. We are really thankful that courtwatchers have been willing and able to do this. We're doing it this way in order to offer our community and the Rollins administration the opportunity in real time to address injustices in the courts, rather than writing a report months later, as well as to document the pace of change. Because DA Rachael Rollins was inaugurated on a Wednesday, we pull and analyze weekly data for periods stretching from Wednesday of one week to Tuesday of the following week. Step 2 – de-duplicate: Sometimes more than one volunteer observes each arraignment, but we only want each person being arraigned/each case to appear in the dataset once. Therefore, in excel we organize by date/court/defendant name so we can easily spot duplicate arraignments based on the defendant’s name and docket number. In order to be able to go back to earlier versions, we save a second copy of the worksheet where the duplicates will be deleted, and then manually clean the data—removing those extra entries after making sure to consolidate any info across the two watchers that is relevant to preserve. ​Sometimes the process takes some creativity because courtwatchers didn’t quite catch the name or wrote down dramatically different spellings. This is why docket numbers can be especially helpful in cleaning the data. However, docket numbers aren’t always announced and courtwatchers don’t always catch them. Step 3 – verify charges: then we sift through the open-ended charges box, back-filling anything that is a “decline to prosecute” charge and wasn’t properly entered. We also make sure that every entry includes the charge the person was facing; we do this by manually scanning every row of data to be sure at least one charge is filled in, and make sure it doesn’t get counted or categorized inaccurately. Because of limited capacity of the CourtWatch MA team, we cannot verify every case against the limited available charge information on masscourts.org. We verify the charge in any case where the courtwatcher left the charge blank, indicated they did not hear the charge, or noted that reading the charge was waived in court. It is of course possible courtwatchers mishear the charge(s) in any given case; our data collection represents our trained volunteers' best efforts and is not a substitute for open government. We are very hopeful that DA Rollins will release data tracked by the Suffolk County District Attorney’s Office and make it publicly available for community review, much like State’s Attorney Kim Foxx in Cook County, IL. During this step, we also try to weed out cases that aren’t actually arraignments, like status hearings / restraining orders / probation violations. We also try to separate out specific dockets when a person was appearing for multiple open cases. If the courtwatcher noted a specific disposition by docket, we separate those cases into separate rows so we can track outcomes across each case in the dataset. Step 4 – count the total number of cases: we use this second, de-duplicated version of the data, once cleaned, to get a total tally of the unique arraignments observed for that week. We also use this version to run comparison questions to the decline to prosecute (“DTP”) subset of cases. 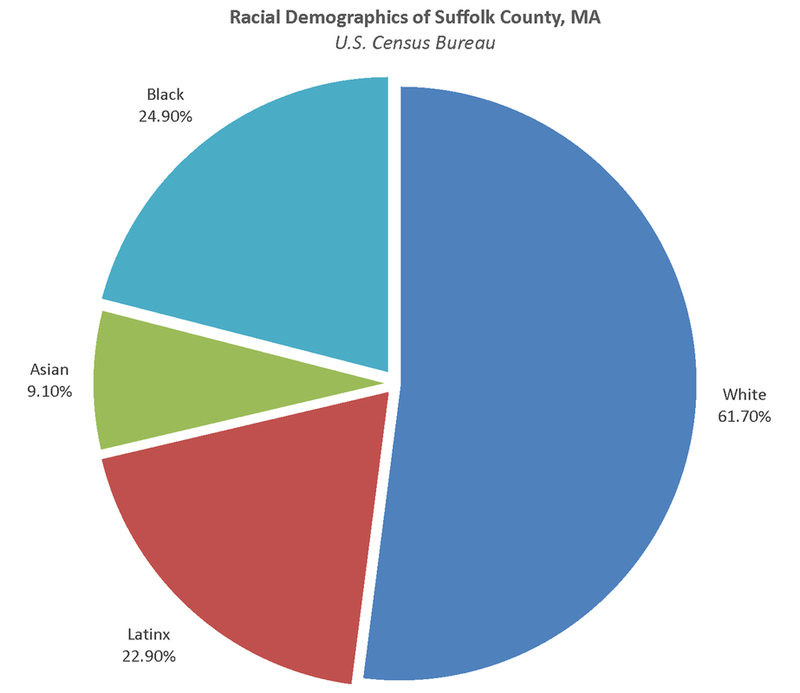 So far there have been hundreds of cases we have not critically examined because we lack capacity to review them and they are not the focus of our project; however, it would be incredibly illuminating if Suffolk County made these data public. Step 5 – DTP subset: finally, we create a third version of the data for cases with only charges on the DTP list. We find these cases based on whether the “other charges” field was left blank. If that field is empty, the row of data for that arraignment gets included in this third version of the dataset. Within that third version, we focus on outcomes, reorganizing the data so that a single column reflects whether the case was dismissed, diverted, bail was set, the person was released, or there was some other outcome. That makes it easier to get relevant tallies. Sometimes courtwatchers fill in two mutually exclusive fields regarding the disposition, so we read the open-ended comments to get a better sense of the actual outcome of the case and fill in the accurate information. Since the administration has not released any official policies, we have had to try to figure out the difference between dismissal and diversion. As reflected in our week 3 digest, we have decided to try to differentiate between cases that end at that arraignment (a true dismissal) and cases where the person is required to come to another court date to fulfill a condition or show proof of compliance (diversion). We acknowledge these are judgement calls courtwatchers have to make in the moment and are grateful they approach their work so thoughtfully. Step 6 – analyze: then we analyze. We write a bunch of functions in excel to get tallies for the number of charges, racial demographics, release decisions and dispositions, bail amounts, etc. Step 7 – write the digest: finally, we take that analysis, put it into prose, and add charts and tables to present the data for public consumption. Step 8 – respond & revise: the team reviews the data and offers some analysis as well as recommendations for how to address serious injustices volunteers witnessed that week and/or departures from the administration’s stated policy goals. And voila! We have a digest. Step 9 – publicize & disseminate: we put the digest out over our twitter account (@CourtWatchMA) and highlight some of the most significant findings in a thread. This complements our daily stories from court, which we find by reading through open-ended comments courtwatchers have recorded in our online data collection form each morning. Follow along with the hashtags #first100days and #storiesfromcourt. For the First 100 Days project, we have asked courtwatchers to watch and record observations at arraignments. We want to make sure community members understand what our volunteers are witnessing, so we have drafted this post giving an overview of arraignments. In Massachusetts, anyone arrested must be arraigned within 24 hours of arrest or the next business day. They will arrive either from the police station in shackles or come in on their own two feet if they were able to post bail or were released on personal recognizance. Bail at the police station is set by a court clerk. People appearing at arraignments may also have been issued a summons. An arraignment is an accused person’s first appearance in front of a judge once a criminal allegation has been made and complaint has been issued. The purpose of this appearance is to formally charge someone with a crime, or divert or dismiss the case, appoint a lawyer if that is necessary, and decide conditions of release if the case proceeds as a criminal matter. Our First 100 Days project is focused on observing arraignments in BMC Central, Roxbury, and Dorchester – all district court divisions of Boston Municipal Court in Suffolk County, MA. Read more about the project’s design and goals. Why focus on observing arraignments? An arraignment is the opening of a criminal case. Initial charging and bail decisions control cases, and they're often handled by the least experienced prosecutors in an office. In the words of Scott Hechinger, Director of Policy & Senior Staff Attorney at Brooklyn Defender Services, "arraignments are outcome determinative." Defense attorneys know this, but so do prosecutors. We are observing arraignments to see whether the charges DA Rollins pledged to decline are actually being dismissed or diverted, but we are also observing arraignments to see how our neighbors are treated, including how people are charged and decisions about bail. Who's who in the courtroom? The Clerk usually sits or stands in front of or to the side of the Judge. They call the courtroom to order and call each case by the docket number and the defendant’s name. The Clerk also reads the charges against the person being prosecuted. It’s the Clerk’s job to record and then read back every decision the Judge makes about each case, including the next court date. Court Officers stand in the gallery or on the floor of the courtroom. They wear uniforms with badges. Court Officers monitor the behavior of the people in the courtroom and may warn people or ask them to leave for things like using a cell phone or wearing a hat. They are responsible for bringing people into the courtroom who are being held in detention and for giving defendants any paperwork from the court. The Judge is announced by the Clerk before they enter the courtroom. They sit at the front of the courtroom on a raised bench, higher than everybody else in the room. At an arraignment, the Judge listens to arguments and makes a bail determination. The judge makes all legal decisions in the courtroom. This includes setting bail conditions including (but not limited to) money bail, GPS shackling, stay away orders, or drug testing and treatment. The judge also decides any motions asked for by either the assistant district attorney (“ADA”), the probation department, or the defense attorney. These might include motions to revoke bail if the defendant is out on bail for any other cases and motions to request a 58A hearing (otherwise known as a separate “dangerousness hearing”). The judge can also decide to accept or deny any other recommendation or resolution before the court including recommendations for dismissal and dismissal pending conditions like a fine, pretrial diversion, or the reduction of the offense to a civil infraction. Judges can set bail higher than, lower than, or equal to the prosecutor’s recommendation, release the individual on personal recognizance, or dismiss the case entirely. The person’s next appearance in court is set around the judge’s (and attorneys’) schedule. The Probation Officer typically sits either to the side of or slightly behind the Judge and Clerk, often at a desk with a computer. They often face towards the gallery. Probation is responsible for managing the criminal court records of everyone accused of a crime. When a person is arraigned, probation will run their CORI (Criminal Offender Record Information) and tell the judge if the person is currently on probation and if probation wants to move for a violation of the person’s probation. People who are being arraigned and not in custody are asked to check in with the probation department at the courthouse before their arraignment. Probation will collect their name and contact information and interview them to determine if they’re eligible for a court appointed attorney. There are usually between 1 and 3 Assistant District Attorneys (“ADAs”) sitting or standing at a table in the courtroom in front of the judge. ADAs are prosecutors, lawyers “for the Commonwealth.” ADAs represent the state’s interest in court and communicate directly with the police about charges. At arraignment, ADAs tell the court a story about the case based on the police report; decide what to tell the court from the person’s CORI to summarize the criminal history of the person being prosecuted; and make recommendations to the court about bail and argue motions. ADAs can also conference with defense attorneys about resolving cases at arraignment. The person appearing for arraignment may be sitting in the gallery or they may be in custody in a jail cell above or below the courtroom. When their name is called, the person being prosecuted will be asked to stand and come forward, or they will be brought into the courtroom in handcuffs into what’s referred to as the “dock,” which is a holding area usually behind Plexiglas and a locked door. The defendant is the person being formally charged with a crime and prosecuted. The defense attorney is usually sitting or standing at the table nearest to the “dock.” There are normally several defense attorneys sitting behind the table. Defense attorneys represent people being accused of crimes. They are responsible for zealously advocating for and protecting the best interests of their clients. At arraignments, defense attorneys argue against prosecutors for lower or no bail and the least restrictive conditions of release. Defense attorneys can also argue motions at arraignment, like motions to dismiss or reduce the charges. Bar Advocate – A bar advocate is a private attorney who is paid by the hour on a contract basis to take court appointed cases. CPCS Attorney – Attorneys who receive a salary from the Committee for Public Counsel Services, a government agency paid for by a line item in the state budget. CPCS has offices in every county. Each office has a social worker, an investigator, and a team of lawyers. While people may have to wait in court for a long time for their name to be called, arraignments happen quickly and can be very hard to follow and hear. Usually people have only had a few moments to talk to their lawyer beforehand. Prosecutors have also had almost no time to review cases. People who have been in custody have not been able to shower, change clothes, communicate with family or employers, take care of pets, or take their medication. If you’ve never observed an arraignment and would like to get a sense of the proceeding, you can read sample fake arraignment scripts here. You can also sign up for our next courtwatch training! In some cases, the Commonwealth is represented in court by law students under the direction of Assistant District Attorneys through the Suffolk University Law School Prosecutors Program. These “student prosecutors” primarily handle arraignments, bail/detention hearings, and pre-trial motions. From January 9th to January 15th, our courtwatchers observed 193 individual people facing charges across three divisions of Boston Municipal Court (BMC Central, Roxbury, and Dorchester). Some of these people had multiple open cases. Courtwatchers observed 198 cases in which they documented a specific outcome. This week, roughly half of the cases observed (49.49%) involved only charges that Suffolk County District Attorney Rachael Rollins has pledged to decline to prosecute, either by dismissing at arraignment or diverting through a non-criminal proceeding, program, or outcome. Again, that means half of the cases we observed processed by our criminal courts this week represented crimes that District Attorney Rollins has identified as low-level, non-violent crimes rooted in poverty, mental illness, and addiction. Our digest will focus on the data courtwatchers collected about cases that exclusively involved charges from DA Rollins’ Decline to Prosecute list. There were 98 cases involving ONLY charges on the decline to prosecute list. 42% of these cases (41 cases) advanced as criminal matters. 51 of these cases were dismissed at arraignment. Therefore, a total of 57 cases, or roughly 58%, were declined within the meaning of DA Rollins’ campaign pledge. Even when cases were dismissed or diverted, the disposition often involved conditions, like drug treatment; a court fee; community service; or probation. In cases of conditional dismissals, individuals were frequently required to report back to court on a future date to prove compliance with the condition—even when that compliance took the form of payment of a fee to the court itself, which the court should be able to verify on its own. When people are required to appear in court, it may mean they have to take time off work, school, or parenting, or pay for transportation to make it there which can be a challenge for working class families. Just as we saw last week, the vast majority of dismissals were driving cases – 41 of the 51 cases (80%) that were dismissed. The other 10 cases dismissed at arraignment were incidents of: Trespass (4); Disorderly Conduct (1); Drug Possession (3); and Shoplifting (2). In 26 cases that advanced as criminal matters, the person being arraigned was released on personal recognizance. ​In many such cases, the court also imposed conditions—especially common was a stay away or no contact order for the place of the incident or a person involved. In 8 of these cases, bail was set. Bail amounts ranged from $150 to $2,500. In 1 case, the ADA asked for personal recognizance for a man charged with receiving stolen property and larceny under $1200 for allegedly stealing a coat, but Judge Sally Kelly set $150 bail anyway. Read more here. In 1 case, in addition to the $2,500 bail, the judge imposed a GPS (e-shackle / electronic monitor), set a 6 PM – 6 AM curfew, and demanded the person being arraigned surrender their passport. This person was charged with possession with intent to distribute. There were two co-defendants in this case, and they all live together. The ADA originally asked for a stay away/no contact order, but withdrew that condition when she learned they all live together, realizing it would be functionally impossible to follow. ADAs’ bail recommendations are incredibly influential because they set the tone of the conversation about the case. Judges ask ADAs to make their bail recommendation first, before the defense attorney has the opportunity to speak. ADAs often asked for bails equal to or higher than the judge ultimately imposed. Again, ADAs get to direct the conversation on bail, so a judge’s decision to set bail at all and to set a specific amount is significantly informed by the ADA. In two of the cases where the judge didn’t flatly adopt the ADA’s recommendation, the judge set exactly half the bail amount the ADA requested. This is significant because it suggests the judge simply split the difference between release on personal recognizance requested by the defense and the ADA bail recommendation. Bail should be tailored to getting someone to return to court and, by law, must factor in the person’s ability to pay. It should not be a knee-jerk compromise. In the remaining 7 cases, we don’t know the release decision or case outcome because the courtwatcher left before the judge resumed hearing the case, the arraignment was continued, or the person being arraigned remained detained (in one case despite the judge deciding to release them on personal recognizance on the pending trespass & drug possession charges) in order to resolve a warrant in another court. 2 had their cases dismissed (charges were disorderly conduct & shoplifting). 49.5% Black, 28% Latinx; 18.3% white, 5.4% East Asian, and 1.1% South Asian. Black and Latinx defendants are once again starkly overrepresented compared to the population, while white defendants are starkly underrepresented. Whose cases get dismissed or diverted? We wondered about the racial breakdown of dismissals and diversion as compared to the entire group of cases involving only charges to be declined. Basically, if you're white, are you more likely to have your case get dismissed or diverted? In fact, the racial demographic breakdowns are remarkably similar, and the percentage of white folks whose cases get dismissed/diverted is lower than the whole decline to prosecute dataset, meaning comparatively fewer white folks are having their cases dismissed or diverted. 49.5% Black, 28% Latinx; 18.3% white; 5.4% East Asian; and 1.1% South Asian. 50% Black; 30.4% Latinx; 12.5% white; 5.3% East Asian; and 1.8% South Asian. However, this finding does not suggest that ADAs are showing special leniency to non-white individuals. The vast majority of cases which get dismissed or diverted are driving cases. These kinds of offenses are disparately enforced from the outset, by police. We suspect white folks are not being stopped by police as often, and certainly not arrested as often, for driving offenses, and that’s where the underlying disparity exists. A substantial body of research – from academic studies to opinions by our own Supreme Judicial Court – confirms that white people are not arrested nearly as often for minor crimes and driving offenses in Boston, in Massachusetts, and in the U.S. in its entirety. ​As a point of interest, we emphasize that a significant number of the “other” cases also exclusively involved minor matters. For example, 12 of the 100 cases reflecting charges not on the declination list were for jurors who failed to appear for jury duty—most of them because they thought they were ineligible. An additional 11 of these 100 cases involved some kind of default removal – for example, missed court dates or failure to prove completion of community service. Many of those defaults were cleared and almost all of the jury cases were dismissed prior to arraignment. As stated above, 41 cases involving only charges to be declined were not dismissed or diverted. Those cases should also be declined, and we hope this will change in the weeks to come. Courtwatchers observed 1 declination case involving a charge of Wanton/Malicious Destruction of Property in which an ADA asked for $500 bail but the judge ultimately released the individual on personal recognizance. In the 8 declination cases in which an ADA requested bail this week, the judge imposed bail 7 out of those 8 times—a rate of 87.5%. ADAs have a tremendous amount of influence over bail. We again emphasize that ADAs should always recommend release on personal recognizance in cases when the person is not a flight risk and should never request bail for charges that are on the do not prosecute list. We appreciate that District Attorney Rollins continues to give interviews focused on the importance of declining the 15 crimes she has identified as criminalizing poverty, addiction, and mental illness. But as this week’s findings again demonstrate, her office is still actively prosecuting people for these crimes. In many cases, even if the charge is dismissed at arraignment that dismissal comes with conditions, whether court costs or community service hours. We have concerns about these conditions. While we support DA Rollins’ pledge to not criminally prosecute people for being poor or suffering from addiction or mental illness, in many cases these folks are similarly burdened by court conditions, whether a fine/fee or community service. As traditionally implemented by our court system, community service is highly prescribed manual labor. Even when a person is given the option to serve at a nonprofit of their choosing, community service may be difficult to complete if that person works, has kids, or doesn't have a car. Finally, judges and ADAs alike have misconceptions about what it means to require someone to complete community service hours through the state program. We look forward to a public release of office policy that will give Assistant District Attorneys guidance on how to carry out DA Rollins’ vision. ​And we emphasize that our method of data collection carries many imperfections which would be resolved by a public release of the data her office already tracks. This count may include a handful of status hearings, restraining orders, or other types of hearings that were not initial arraignments. By our best estimation based on the data we collected, this week’s observed cases involved 207 unique dockets. However, courtwatchers did not always record disposition by individual docket, more often noting the hearing outcome by defendant even when they wrote down multiple docket numbers. Further, we note that the total number of hearings observed is not the total number of arraignments which transpired in those courts. For a full count of arraignments, you can view sparse information about all criminal cases, by court and date of filing, at masscourts.org. Select the court, use the “case type” tab, select the relevant date(s), and select both “criminal” and “criminal cross site” as the case type. Because of limited capacity of the CourtWatch MA team, we have not verified every case against the limited available charge information on masscourts.org. We have verified the charge in any case where the courtwatcher left the charge blank (roughly 15 cases out of 198), indicated they did not hear the charge, or noted that reading the charge was waived in court. It is of course possible courtwatchers misheard the charge(s) in any given case; our data collection is not a substitute for open government and we are very hopeful that District Attorney Rollins will release data tracked by the Suffolk County District Attorney’s Office with some regularity going forward. Courtwatchers write down demographic information (age, race, gender) based on observation alone; we recognize that this is an imperfect way to determine markers of identity. We ask courtwatchers to note this information because (1) courts are unlikely to disclose this information even if we requested every docket; and (2) the system operates based on an individual’s outward perception and expression, regardless of their stated identity, so demographic observations are a reasonable methodology for this particular project. Commonwealth v. Warren, 475 Mass. 530, 539–40 (2016); Jeffrey Fagan et al., Final Report, An Analysis of Race and Ethnicity Patterns in Boston Police Department and Field Interrogation, Observation, Frisk, and/or Search Reports 2 (June 15, 2015); ACLU of Massachusetts, Black, Brown and Targeted (2014); Amy Farrell, et al. Massachusetts Racial and Gender Profiling Study, 24-27 (2004). Based on 2011 data, the Bureau of Justice Statistics found that Black drivers are more likely to be stopped, ticketed, and searched than white drivers, and more often for violations other than speeding, like a vehicle defect or a record check. See also generally Emma Pierson, et al., A Large-Scale Analysis of Racial Disparities in Police Stops Across the United States, 5-7, Stanford University (2017); David A. Harris, ACLU, Driving While Black: Racial Profiling on Our Nation’s Highways (1999). To differing degrees, this pattern of stopping and arresting people of color for “driving while Black” or “driving while Latinx” emerges around the country, from Philadelphia to Milwaukee to Illinois.